Update: Your share is now $20 a month per member! Make Money Sharing Daily Fantasy Tools: 50% Commission for Life! How much can I make? You will earn 50% lifetime share per member you refer to use our Daily Fantasy Tools. Our top affiliate is earning over $3,000 a month in re-occurring commission and growing! Some of our most successful partners share our Daily Fantasy Tools by posting free YouTube videos showing the players they think will do well for that day. If you are a sports expert, it's a simple screen record and upload to YouTube. We will show you exactly how to get started, there is nothing stopping you, you can do it in under 1 hour a day! We will show you step by step how to do everything! How it works: Use your unique tracking link to invite people to try our daily fantasy tools. When someone clicks through your link they will be tagged with your tracking code. 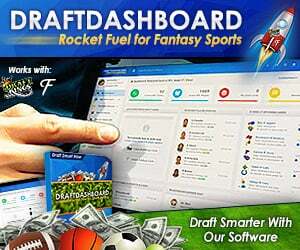 If that person ever signs up for Draft Dashboard, you will earn 50% of their monthly fees for life! DFS is a new and fast growing market, send your tracking link to people who play DraftKings and FanDuel and you will do really well! Email us with any questions! Unique Tracking Link: Create a free ClickBank account to get your Tracking Link! Create a Free ClickBank Account! ClickBank will track your sales and payout your commission earnings every week. This is free and only takes a minute. Email us with the ClickBank username you just created and we will reply with your unique tracking link and instructions on how to test it! Use your unique tracking link to refer people to try our DFS Tools and start earning money! Already have a ClickBank account? *Replace "clickbankusername" with your ClickBank username! Take a screen shot of a cool page on Draft Dashboard and post it to your Social Media accounts using your unique tracking link! Post a video of you using the tools and invite people to try the tools using your unique tracking link. Find online forums talking about Daily Fantasy Sports, and invite the community to try the tools using your unique tracking link. You may want to use a service like http://bit.ly to shorten the link so people don't know you will get credit for the sale, sometimes that turns people off if they think you have something to gain by referring them. Blog Post or Wordpress Website! Think of your own Creative Ways! The most successful partners are the ones who will create unique articles, pictures and videos to educate people how to use Draft Dashboard to Create Winning Daily Fantasy Lineups. Create that unique content and then find a way to get it in front of DraftKings and FanDuel players using your unique tracking link. Create Winning Daily Fantasy Lineups for DraftKings and FanDuel! Create Winning Daily Fantasy Lineups for DraftKings and FanDuel with our DFS Lineup Optimizer! Playing DraftKings or FanDuel? Instantly Create Winning Daily Fantasy Lineups with our DFS Lineup Optimizer! Below are a selection of banners, both static and animated, to promote Draft Dashboard with on your website Copy and Paste the code below into your HTML. *Replace clickbankusername with your ClickBank username.